NamPower abrasive discs are high-performance brushing tools for automated deburring and surface finishing. Their unique combination of ceramic and silicon carbide abrasive produces maximum burr removal rates and an optimum surface finish at the same time. Designed for use with today’s machinery, these abrasive disc brushes integrate easily with CNC machining centers, transfer lines, and robotic cells. As a full-line supplier of surface finishing and deburring tools, Brush Research Manufacturing (BRM) offers NamPower disc brushes in different styles, diameters, trim lengths, and grit sizes. During disc brush selection then, manufacturers need to consider all of these product specifications. During brush tool use, application guidelines for aggressiveness, contouring, and fine or coarse finishing should be considered. NamPower abrasive disc brushes come in two styles: dot and turbine. Dot-style disc brushes are used for light deburring. Turbine-style disc brushes are used for medium and heavy-duty deburring. Brush style is important, but it’s not the only specification you’ll need to consider if you want a more aggressive or a less aggressive brushing tool. Application guidelines are also important. For more aggressive brushing, choose a NamPower abrasive disc brush with a shorter trim length, larger diameter, and coarser grit size. Then increase the cut depth and spindle speed. For less aggressive brushing, select a NamPower abrasive disc brush with a longer trim length, smaller diameter, and finer grit size. During abrasive disc brushing, reduce the pressure on the part or work piece. Surface contours such as curves affect the recommended operating parameters for NamPower abrasive disc brushes. Typically, spindle speed is decreased with increased depth of interference so that brush filaments conform smoothly to part contours. Compared to flat surfaces, contoured surfaces are brushed at slower spindle speeds, greater depths of interference, and with increased pressure. The application guidelines for NamPower abrasive disc brushes also specify longer trim lengths and lighter-density brushes for contouring. Dot-style brushes have a lighter density fill than turbine style brushes, and this promotes filament entry into small holes and spaces. NamPower abrasive disc brushes with finer grits are also recommended for use with contoured surfaces. NamPower abrasive disc brushes support a variety of applications, including surface improvement and weld cleaning. Typically, the removal of excess weld material requires a coarser-grit tool. Conversely, the final finish on machined parts such as medical implants must be very smooth and burr-free. NamPower abrasive disc brushes support both fine and coarse finishes, but application guidelines vary. For finer finishes, choose a finer-grit disc brush with longer filaments and increase the spindle speed. For coarser finishes, select a coarser-grit tool with shorter filaments and reduce the spindle speed. Fine finishes use a coolant during brushing; coarse finishes do not. Using a NamPower abrasive disc with a coolant also promotes a smear-free finish when the tool is used at decreased pressure and reduced speed. 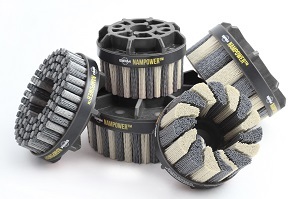 How much do you know about NamPower abrasive disc brushes? For example, what are the available tool diameters, trim lengths, and grit sizes? Following BRM’s application guidelines is important, but you’ll need to understand all of your options to make an informed decision. Find the information that you need. Download the NamPower Resource Guide.